In Information Technology, specifically the ‘information’ part, we are concerned with capturing, storing, analysing, using and protecting data. Management Information is the interpretation of raw data to report on activity and progress, make decisions, meet legal and compliance regulations, and many other uses. (The full French quote is, ‘plus ça change, plus c’est la même chose’ which translates to, ‘the more it changes, the more it’s the same thing’). You might imagine that Management Information is a fairly static and stable part of the business and IT ecosystem. However, there have been a lot of changes in recent years to the type of data available and the technologies that underpin the provision of Em-eye. Luckily for you, reader and learner, and in the spirit of the table of IT elements, the underlying principles and good practice still apply. Data are not exclusively internal financial measures, but can come from the marketplace and competitors, Customers and operational processes. Increasingly website usage (analytics) and Big Data influence near-real-time marketing and operational decisions, not just retrospective reporting and longer-term strategic planning. In a broader sense MI and an organisation’s Management Information Systems (MIS) are also concerned with the management of business processes, people and the effective utilisation of resources (not just following the money), possibly using Enterprise Resource Planning (ERP) software systems. This introductory module will explain some of these terms and give you a taster for your own wider and deeper learning and investigation. …an organised approach to the study of the information needs…[to help management] make operational, tactical and strategic decisions. …designing and implementing procedures, processes and routines that provide suitably detailed reports in an accurate, consistent and timely manner. …computerised systems [that] continuously gather relevant data from both inside and outside an organisation. This data is then processed, integrated and stored in a centralised database…where it is made available to all who have the authority to access it, in a form that suits their purpose. There are a few concepts mentioned here that are important for managers and other data users/consumers, Database Administrators and CIOs. Access – You have heard the truism that, ‘knowledge is power’, well control of access rights and permissions are where that power is exercised. There are also security implications if someone unauthorised can see sensitive information (Data Protection and related topics covered in the Security element), or worse still if changes can be made without clear justification and an audit trail. Accurate – Of course data should be accurate and from a verifiable source, although there is still the jeopardy of incorrect or misleading use and interpretation of the data. Consistent – This goes beyond accuracy to ensure the integrity of the data as it is stored and managed within a database system. Rules are defined so that data are correctly coded and values are within the prescribed value range and type. Internal consistency is also important to maintain relationships between datasets, including identifying keys and the order of updates. Timely – This depends on the purpose of the data, information is not inherently good or bad because it is 1 month or 1 second old, only that it is appropriate to the required use. Data should be clearly date- or date and time-stamped, normally at record level, to indicate when it was produced, its validity or currency. If the data is changing rapidly or is time-critical then any management information that relies on it must be equally responsive. Suitable/relevant/suits their purpose – Ultimately the value or quality of MI is determined by the recipients or users of the information. 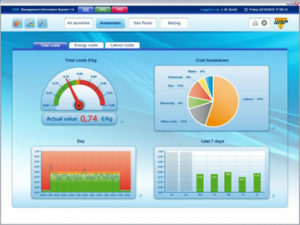 A dashboard, like the car equivalent, provides a visual summary of key measures/metrics of interest, possibly including some summary headline figures, status traffic lights, graphs & statistical analysis etc. and the ability to look at the underlying or source data more closely, or drill-down. Dashboards – or consoles – normally provide a real-time snap-shot of some operational process, network or project, but they can also be created as an alternative rich view and querying tool to access an historical data set or data model. To serve any non-trivial MI or reporting needs there will be an underlying data model, whether visible to the user or not, which defines how the data is organised and coded. Data modelling is outside the scope of this module, but suffice to say, the ability to ask questions of the data, which is fundamentally what MI is, normally involves constructing a syntactically correct query based on a clear and unambiguous ‘map’ of the domain. The map is referred to as a database schema (ski’ma). A spreadsheet might be the only technology that you use to analyse data and create your management reports, but without a database, an [explicit] data model or the need to invest in a dedicated MIS solution. If you are not familiar with spreadsheets there is an introduction here. The main advantages are the ease of use and flexibility and low cost as an entry-level analysis and reporting tool. The main disadvantages are the lack of integration, automation, scalability and security features. Although it is possible to import data from an external source, handle large datasets, and lock worksheets, it doesn’t provide a viable enterprise-level solution. Just because you can do something doesn’t mean that it’s right. Computers are very good at modelling real world things, in the case of spreadsheets they make good calculators, and are good at recreating financial ledgers, producing accounts and financial reports, product inventories, rating or actuarial tables, or carry out analysis of data trends, chart sales performance, graphically represent costs by category over time etc. However, they are less useful at mining complex data structures, analysis of real-time business data, and developing models of future scenarios using fuzzy logic. 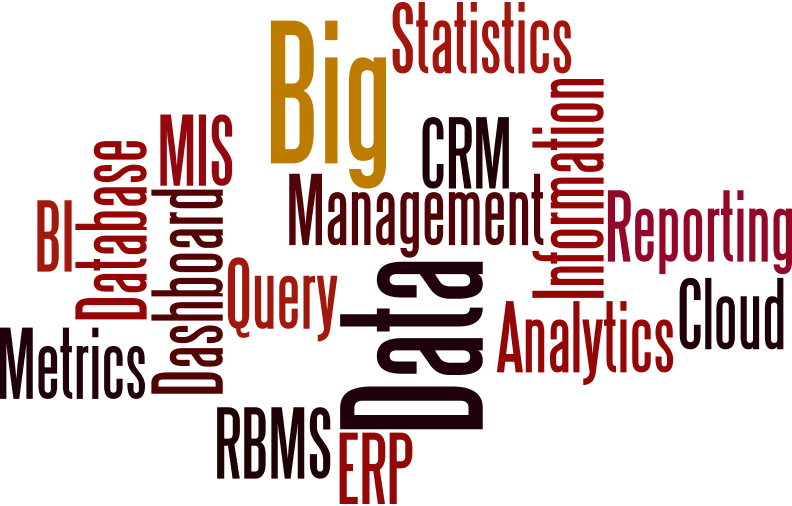 ERP/CRM/BI – some more acronyms! These three ideas and technologies occupy the more sophisticated, ‘business’ end of the market. Enterprise Resource Planning is a class of business process management software that allows an organization to use a system of integrated applications (modular) to manage their business and automate many back office and operational functions such as ordering, stock management, finance and human resources. Although it can be a significant cost and commitment to implement, the benefits of a single data model and shared real-time information across business areas can be very powerful for making operational decisions and cost management. Customer Relationship Management focuses on data associated with your Customers; how they interact with your organisation and systems, their behaviour, through the normal buying cycle, and ideally lifetime value. The latter is key, the aim is to improve business relationships with customers, assisting in retention and driving further sales, increased exposure or more leads, depending on your business model. Business Intelligence – or Business Analytics – uses technology to analyse data and present actionable information to help managers and other users make more informed decisions. Data are collected from internal systems and external sources, not so much to automate and facilitate the information flow (ERP) but to focus on analysis and creating reports, dashboards and data visualizations for operational and executive decision-making. 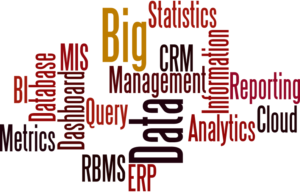 Big Data is a hot topic but also has its own IT element. As the name suggest it is a category of extremely large data sets that may be analysed computationally to reveal patterns, trends, and associations, especially relating to human behaviour and interactions, but also tracking market and weather fluctuations – for example – to try and predict future behaviour. Treat your data and your MI systems seriously. Data security and the prevention of accidental or malicious loss or corruption of data are important for legal, commercial and reputational reasons. Computers and IT systems should be your servants not your master, and that is particularly important for MI. Too much or inaccurate data or a lack of informed analysis can lead to mistaken decisions or even data paralysis! As techies used to say ‘Garbage in garbage out’! I hope you enjoyed this module from the IT elementary school. Other topics are available in or search the blog and other content to find answers to your computing and IT questions. The IT Chemist is the brains behind the IT Elements. He comes from a science and engineering background (of course!) What he lacks in creativity and the social aspects of IT, he more than makes up for with a thorough understanding of the raw material needed to make technology projects and business change initiatives successful. He is the ‘go to’ man if you have any questions about the Table of IT Elements. In his spare time the IT Chemist likes to catalogue his bus ticket collection and repair his Sinclair C5.